Coprophagia (often misspelled as coprofagia) is a medical term for 'dogs eating poop'. It's fairly common in puppies and they're not always fussy about who's poop they eat! Learn more about this disgusting habit; why dogs eat poop, and what you can do to stop it! Yuk!...I hear you say, but although it's deemed anti-social by us, it's fairly common in the dog world, especially in puppies. It's more often seen in puppies of up to a year old, (who thankfully will eventually grow out of it) but dogs of any age can indulge in this 'unpalatable' habit. And to make matters worse they're not always fussy about who's poop they eat - some dogs have been known to eat the contents of the cat's litter-box, treating it like a cookie jar! Before our dogs became domesticated, their mother would lick her puppies' bottoms to stimulate bladder and bowel movement. She would then eat their poop to remove any evidence of her puppies to help protect them from predators. You'll still see mothers cleaning her puppies in this way today as the instinct is still strong within and drives her to 'protect' her young puppies. It could be that by keeping her nest area clean in this way, the mother is also teaching her puppies not to soil in their own den, which they tend not to. Unfortunately, at some time, our pets may suddenly decide to indulge in coprophagia, for many reasons. Mine did when he was a very young puppy (I was horrified when he sicked it up in the car on my lap!) Unfortunately, in my panic to remove it, I pushed it down between the seat and the handbrake. It took ages to get it out and the car smelling fresh again. If you catch your puppy or dog eating poop, it's best to do something about sooner rather than later, and certainly before it becomes a habit that's too difficult to break. Aside from being a pretty anti-social habit, ingested poop can pass on unpleasant diseases and/or parasites to your Cocker Spaniel, not to mention what it could pass on to us and our kids! Although our children are often taught to wash their hands at an early age, it's a good idea to emphasize the importance of washing their hands after petting their dogs. You can never be too careful. Now you know what the word 'Coprophagia' means, you can follow on and find out why dogs eat poop in the first place. There are many reasons why your pet may be doing this; he may be hungry, bored, he may be overfed or his food may not be nutritious enough. Also, if your pet has an infestation of worms or parasites, it could result in a deficiency of essential nutrients which could lead your Cocker to eating his own dog poop in a bid to get the extra nourishment his body needs. Another good reason to make sure your Spaniel is up to date with his parasite and worming treatments! There are many different ways of addressing this problem and I can recommend one or a combination of these solutions to help stop your puppy eating poop. In the meanwhile, keep your pup away from poop, clear away any mess quickly to remove the 'temptation'; don't give him the opportunity to indulge in the first place! 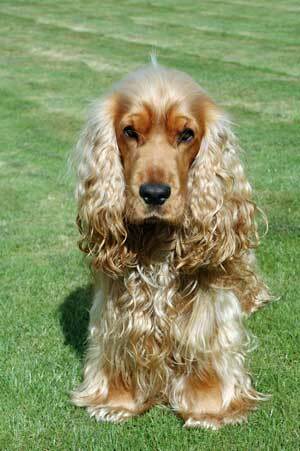 The really good news is that eventually your Spaniel will (almost certainly) grow out of it! If your puppy or dog indulges in coprophagia, it could point to an underlying medical problem. If your attempts to stop your Cocker Spaniel's anti-social habit have failed, I recommend you speak to your vet who will quickly diagnose or rule out any medical problem and will be able to help you further.